CHICAGO (AP) — Prosecutors on Monday asked Illinois’ highest court to review the less than seven year prison sentence for the white Chicago police officer who fatally shot black teenager Laquan McDonald — an unusual move in what was already a rare case. 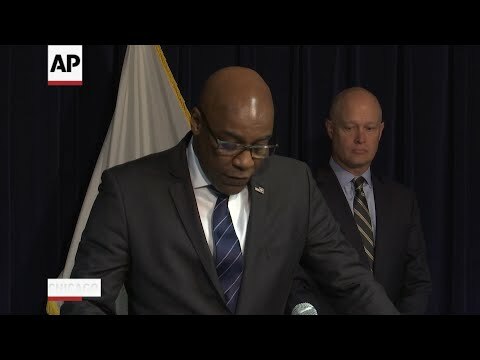 Illinois Attorney General Kwame Raoul and the special prosecutor who won a murder conviction against former officer Jason Van Dyke, Kane County State’s Attorney Joseph McMahon, said they believe Cook County Judge Vincent Gaughan improperly applied the law last month when he sentenced Van Dyke to six years and nine months in prison. Raoul and McMahon filed a request with the Illinois Supreme Court seeking an order that could ultimately result in the court forcing Gaughan to impose a longer sentence. “This is the first step in asking the court to declare that the trial court improperly sentenced Jason Van Dyke for the murder and aggravated battery of Laquan McDonald and to order a new sentencing hearing,” Attorney General Kwame Raoul said at a news conference. Monday’s court filing was the latest chapter in an ongoing saga that has included massive demonstrations, the firing of the police superintendent by the mayor and the ouster of the county’s top prosecutors by voters a few months later. Police video of the shooting that the city released in 2015 under court order showed Van Dyke firing 16 bullets into McDonald, some of them after the 17-year-old fell to the ground. The sentence for Van Dyke was the first imposed on a Chicago police officer for an on-duty shooting in a half century. It followed a jury’s decision in October to convict the officer of second-degree murder and 16 counts of aggravated battery with a firearm. The central issue in prosecutors’ petition is an Illinois law that allows a judge to sentence a person for only the most serious crime when he is convicted of multiple crimes for what amounts to a single act. Gaughan determined that second-degree murder was the more serious crime, although it carries a lighter sentence than aggravated battery. The murder charge calls for a sentence of between four and 20 years in prison, compared with six to 30 years in prison for aggravated battery. One of Van Dyke’s attorneys, Darren O’Brien, said Monday that prosecutors’ contention that the judge should sentence Van Dyke on the aggravated battery charge because it is more serious than second-degree murder doesn’t make sense. “It’s common sense that the lesser harm of getting shot would merge into the greater harm of getting killed,” O’Brien said. “This is the only way for us to challenge the legality of a sentence,” McMahon told reporters. Van Dyke’s attorneys have notified the court of plans to appeal the conviction, but O’Brien declined to discuss what arguments they may make. Raoul took office in January, and Van Dyke’s attorneys have decried the decision to review the sentence as a political stunt.